Animal Defenders International : Publications : Toto and the great escape! Toto and the great escape! 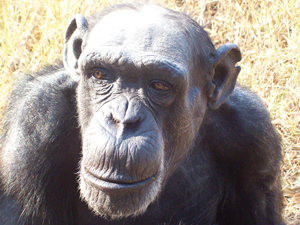 Toto continues to enjoy his freedom in the Zambian bush at Chimfunshi and now shares his enclosure with twelve other chimps. He’s come a long way since we saved him from isolation, living in a packing crate in Chile, but his 14 acres may still not be quite enough, as he recently led his family on a breakout! Chimfunshi staff got quite a shock when they went to prepare breakfast for the chimps, and one by one the Toto family filed out of the foodstore into the courtyard, having helped themselves! A face-off between staff and chimps ensued with a flurry of excited hoots from the chimps. It was a tense moment for the humans, because even the smaller chimps are very powerful and Toto is a huge chimpanzee. However, gentle as ever, Toto calmed down the younger ones as the staff attempted to lure the chimps back into their enclosure. For our gallant leader, Toto, the lure of peanuts and biscuits proved too good to resist – he followed the bucket of food back into the enclosure and with him went his band of escapees.